New Species NOW Online, from Hawaii to Maine! March 30, 2004 - Click on 'Maps and Data' and look at our newest animals that we are tracking! Monk Seals, Hooded Seals, Gray Whale and Surf Scoter are the most recent additions! 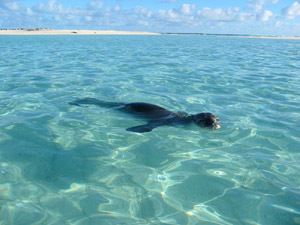 With a new collaborator in NOAA, we are excited to investigate the special movement of the Monk Seal in HAWAII! Hooded Seals have been released in Maine and the Surf Scoter coming on board in the mid-atlantic are poised to migrate within the month.